Long time no see, hmm? I just want to take a moment to write out a very big apology to you all, and to explain my absence, and hopefully leave you all at the end of it feeling happy and excited. At the very end of last year, my husband and I unfortunately lost a child and it was really an awful time indeed. Without going too much into it, I'm sure all of you can understand that I simply wasn't able to code or manage much of anything at that time. A couple of months from then, I began to reassess a lot of things in my life and Exhibited was one of the first things I took a look at. Exhibited, as it stands, has been running since 2008 (with the prologue to it from 2006), with me as the sole owner and coder in that whole time. It is my passion, and I came to view many of you guys as friends and family. One thing I always marvelled at was how wonderful our little community was, how it could be both so tight-knit and welcoming at the same time, and just how generous everyone was with one another. (Not to mention, we are all a group of awesome dinosaur nerds, and that makes us cooler than everyone else!) But the game itself, though something I adore, cannot fully progress into what I imagine without a heck of a lot of changes. Anyone that's been a member of Exhibited longer than a year will know that I often recode and "refresh" the coding, and usually tighten up features, improve them, and coincide that with a new layout or two. Not all of the changes are completely well received which is understandable (we are all different), but to get EX on par with other games out there and fully "modernized" would require so many changes that it simply wouldn't be fair to players on EX because the game that they have come to know would become virtually unrecognizable. So I decided that after 7 years, EX deserved a sequel, and that is what I have been working on for the past few months. I have teamed up with my long term friends and coworkers: artist Xylax (who took over doing all markings, some species, and items here at Exhibited at some point late 2011); and, as of two weeks ago - programmer Rykos, who has been our on-hand "go to" guy for emergencies and server issues since 2010. He has also designed the majority of Exhibited's layouts. Together, and with all mods' input, we have been working on something pretty incredible and I really think all of you guys will love it. I will retain the majority of Exhibited's features so that EX II will be familiar, and keep the ideas and game mechanics that already work so well. But alongside those I am introducing lots of shiny new features that wouldn't fit too well in EX without feeling out of place, as well as making notes of much-longed for features that people have campaigned for on EX for years. This is basically another chapter, and I invite all of you guys to be a part of it. EX II is not ready for me to show you guys yet, but I would like to keep polling you guys and asking for feedback on various features, so that we can tailor the game to what you want too. But what does this mean for Exhibited? Is it just going to close? No. I won't close EX, not so long as there are people - even if it's just a handful, as now - actively playing it. Exhibited will remain open for as long as possible. I will at some point turn off registrations to Exhibited. The reason for this is that EX II will offer rewards and priority access for Exhibited members, and I wouldn't want people to signup on EX just to get some rewards on EX II - I want the rewards to be special, and to show previous achievements and successes you guys attained through playing Exhibited. Scales, also, will be transferrable to EX II. It will be entirely optional if you wish to join EX II in the first place or not, but also if you wish to transfer some of your Exhibited data - but scales will be included. Any scales you have on EX can be traded into EX II, and to make things a bit sweeter, any scales you purchase from the date of this news post will be transferrable, even if you spend them first in Exhibited. You'll notice that our wonderful moderators are still here, and have kindly stepped up to continue doing some running of Exhibited while I work on EX II. Bob and Herbal will be able to request smaller updates for Exhibited and I will code them in, as well as supply them with lots of prizes for fun chat events and competitions. Exhibited is still running, still working, and any bugs I hope to pick out as and when they arise, with the mods' assistance. Exhibited will continue to run and nothing will change (except for maybe a few updates! ), and I will continue to update you all about EX II and ask for your feedback and thoughts on features as they arise. * ALL dinosaur species getting the center stage - not just carnivores, or raptors. You'll be able to have enclosures full of triceratops, iguanodon, stegosaurus etc. 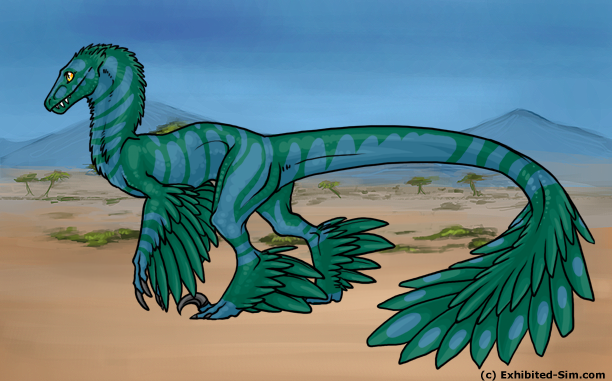 For fun, we'll also include other prehistoric animals, such as Smilodon and terrorbirds. If it's prehistoric, it's relevant!! Those are just a tip of the iceberg, but I hope they are exciting enough on their own to make you feel very, very good about EX II. In the meantime, we bring you a new BG! A Savannah background that looks better on dinosaurs that aren't this one, since he's blocking out the pretty tree with his chest, like a jerk. I recommend using this background on a dino with a lion mane overlay and singing "Circle of Life" while battling it. The savannah BG is stocking in the main background store for 5,000! Also! New month means new monthly item! By popular demand, we bring back the Herbivore Lake Planning Permission item! The lake is a permanent herbivore enclosure upgrade that automatically waters 80 herbivores per day! It's a handy tool for relaxing like a pro. 1) Spotty (#785) with 150 infections! 2) Brother Woodchuck (#21071) with 146 infections! 3) Jylani Amplex (#9064) with 135 infections! 4) Pegasus Queen (#3082) with 109 infections! 5) Mirewyn (#27650) with 104 infections! Hope everyone has a great day which involves a lot of candy and videogames, movies, or whatever other festivities you happen to enjoy! 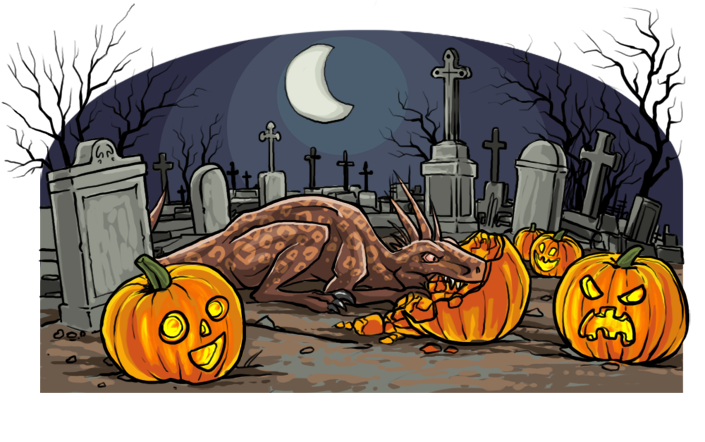 Also, everyone make sure to do all your final spooky dino things, and see if you can trick or treat at Kitty's page to get a free (though rare) scale! And so begins our Halloween partying for this year! Everyone has become some form of Halloweeny monster for the rest of the month! Score points for your club by using the right weapons against the right enemies! You collect items randomly by browsing the site. On the 1st of November the winning club's team will award 2 scales to every player part of that club who participated (and attacked 50+ enemies). All the loser clubs will be given 20 tokens though! (If you attacked 50+ enemies).. So fight hard! On the boards you can also infect other players, spreading the zombie virus around! You can't tag fully infected players, players who last tagged you, or players you tagged last. Each tag also -1 from your infection, so it pays to invite others to tag you! You can grab pumpkins in the same way you grab club wars items and you can head over to the pumpkin patch to carve them! My costume contest is still going on :D The entries I've seen so far have been awesome, so keep em coming! Also, hope everyone who got the new Pokemon game is enjoying themselves :D otherwise, have a great day! Hope everyone had a great September, but now it's time for a month of cold weather, candy and excuses to wear confusing outfits! Finally, we'll be running some form of contest later this month. We're thinking some sort of writing/drawing contest, but if anyone has any ideas, we'd love to hear! Hello all and welcome to the weekend! Congratulations for surviving another 5 or so days of school, if anyone wants an EX cookie, post in the comments and I will supply u3u! Hello my lovely EX-ians! Bob here today! We've got a few things to announce, and an apology about the lack of updates lately! This does mean that Kitty's been extra busy though! So to help her out, Herbs and I have been appointed as caretakers for the site so she can focus on coding! This basically means that I get an excuse to run contests and other nonsense more often, and get to spam you all with news updates telling you how much I love you all. Thirdly! Ta-da! Finally have a different monthly item! If anyone has any requests for returning items, lemme know on this post! Finally! I'm planning on setting up a little "choose your own adventure" contest over the weekend on the boards. I've done it before in chat, but I know java doesn't get along with everyone, so I'm trying to adapt it to forum style. Little prizes for all who enter, big prize for winners <3!